1886 E.T. FISK Australian Radio Pioneer. Ernest Fisk was born at Sunbury-on-Thames, England, on 8th August 1886. At age 16 he attended the Marconi Company's wireless training school at Liverpool, England. Both there and at the Marconi Works and Laboratories at Chelmsford he gained his early training in wireless engineering and operating. His outstanding ability was soon recognized by the company and, in 1909, he was sent on a special mission to the Arctic ice fields. Then, in 1910, Marconi employed him to demonstrate their wireless systems to the Newfoundland sealing fleet. New York was his next stop, where the American Marconi Company had him erect and operate a number of radio sites for them. This task was followed by his assisting in the early development of a maritime wireless communications system along the St. Lawrence shipping route. Such a diverse wireless background served him well during his next deployment for the Marconi Company, which was in Australia . The photo at right shows Fisk in 1911. In 1904 the Marconi Company erected a wireless station at Queenscliff, on the Victorian southern coast, along with a complimentary station at Devonport on Tasmania's northern coast. The purpose of these two stations was to demonstrate to the Australian government and it's people the practicability of wireless communication across Bass Strait between Australia's two land masses. However it was not until 1910 that this new science of wireless, as a communication medium, began to be taken seriously by Australia. In that same year Ernest Fisk arrived in Australia as an employee of the Marconi Company. Marconi was at this time in negotiations with the Orient Steam Navigation Company with the ultimate aim of fitting all their ships for wireless. 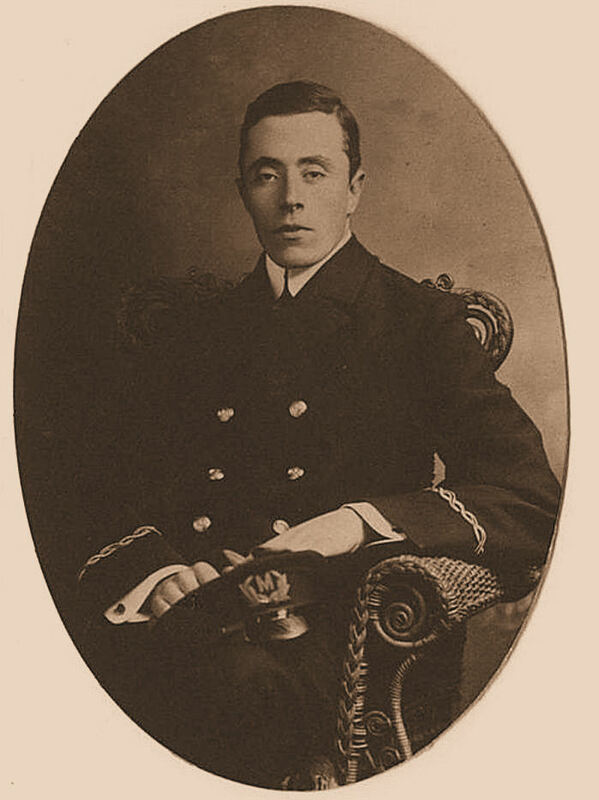 In order to demonstrate the advantages of the service that this would provide Orient Steam Navigation Company, Ernest Fisk was stationed, as a wireless operator-engineer, on their ship the "Otranto". Fisk made two trips on that ship and amply proved to the Orient Steam Navigation Company the value of Marconi's wireless equipment. At the same time he established several world wireless records, including two-way communication between the British Warship "Powerful", moored in Sydney harbor, and his location 200 miles to sea off Fremantle, Perth. In May 1911, following this successful demonstration Ernest Fisk was appointed resident Australian engineer for the Marconi Company. From a small office in Bond Street, Sydney, and in the name of the Marconi Company, he set out to further develop wireless usage throughout the Commonwealth of Australia and it's territories. The photo above show Ernest Fisk in 1924. During this early period in Australia, one of Ernest Fisk's roles for Marconi had been to equip various Australian shipping companies with Marconi wireless equipment and also, where possible, act as ship's wireless operator. At this time Australia had no established wireless coastal stations for communicating with ships at sea. In order to meet this need Fisk arranged a roster system, having ships in port communicate with other incoming and outgoing wireless equipped ships at sea. Under the roster, in-port ship's wireless operators were encouraged to keep wireless watch, communicate messages to other ships both at sea and in port, and deliver any messages to the Post Office for further transmission and delivery if necessary. These in-port ships thereby acted as temporary coast stations. It was a mammoth task, however the difficulties faced by Fisk in achieving these goals merely served to whet his appetite for the future work which lay ahead of him in guiding Australia into the wireless age. Fisk's original Marconi appointment in Australia was for a six month period only, however he so enjoyed the challenges presented by his job that he requested Marconi Company to allow him to stay on permanently. In 1913, as a result of Australian Government pressure, the Australian Wireless Company, which represented Telefunken interests, was merged with the Australian branch of the Marconi Company to become Amalgamated Wireless Australia Limited, AWA. At the age of 27 Ernest Fisk was appointed General Manager and a member of the founding board of the new AWA company. He remained AWA's General Manager until 1916, at which time he was appointed Managing Director, a role he played until 1944. One of Fisk's early goals for this new company was to manufacture wireless equipment in Australia instead of importing it from overseas as had traditionally occurred. AWA could readily achieve this due to their access to both the numerous Marconi and Telefunken wireless patents. Under Fisk's guidance the new company also set about developing maritime communications in the region as well as training operators in the Sydney/Melbourne Marconi Schools of Wireless. By 1927 20 ships of the Mercantile Marine had been equipped with wireless, manned by 250 operators, largely as a result of the Fisk/AWA initiative. The year 1916 also saw Ernst Fisk marry his Australian bride, Florence Chudleigh, at St John's church in Gordon, NSW. World War 1 presented Ernest Fisk with a severe testing ground. At it's outbreak he volunteered for active service in the armed forces, however the Australian Naval Board requested that he continue his wireless work in Australia with AWA. To this end he trained and supplied wireless operators and engineers for both the land, sea and transport forces, as well as the merchant navy. He established wireless detection stations stations at various points around the Australian coastline, and organised wireless based protection measures for Australian ships at sea. The photo at left shows AWA's York Street, Sydney, headquarters. In 1916 E. T. Fisk took a visit to England on behalf of Amalgamated Wireless Australia in order to discuss with his colleagues at the Marconi Company a matter that was of great interest to both parties. The Australian coastal stations had been picking up signals from Germany's major wireless transmitter at Nauen. There had been no previous experience of wireless reception over such a great distance. Fisk believed that direct wireless communication between Britain and Australia was possible. He arranged for test transmissions to begin soon after his visit, using the Marconi high power longwave station at Carnarvon, Wales. 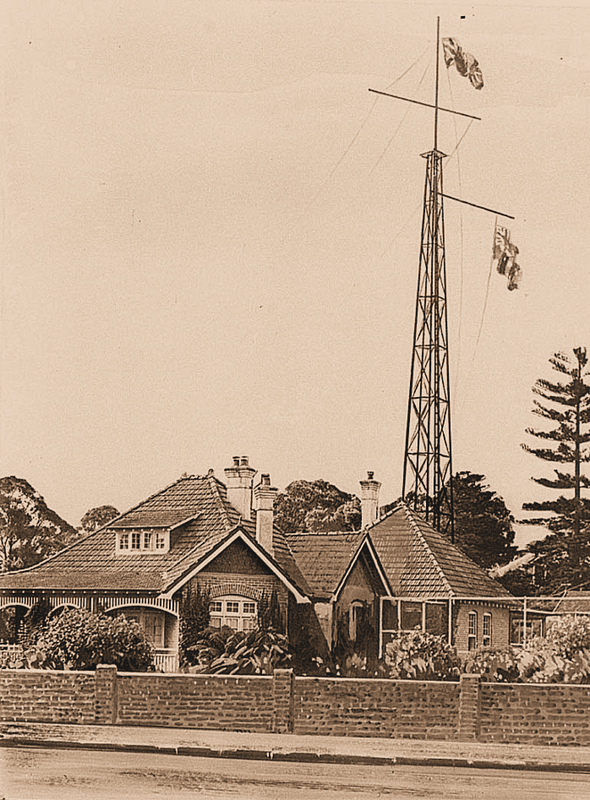 These efforts were rewarded when, on 22nd September 1918, he received the first wireless message from Carnarvon at his own experimental amateur station in his home at Wahroonga, NSW, a photo of which is shown below. This success led him to advocate a direct wireless service between Britain and Australia, the Marconi Company also backing him in this proposal. Marconi claimed that they could carry all classes of messages at a price 33.3% below normal cable costs. The Australian Government liked the proposal, however the Post Offices of both England and Australia unfortunately opposed it. This initial opposition ultimately led to the formulation of a scheme called the "Norman Plan" by which messages where to be relayed via longwave stations located 2000 miles apart between England and Australia. The Australian government, and Fisk, were not completely satisfied with such a solution, so when he attended the 1921 Imperial Conference in London, the Australian Prime Minister, W. M. (Billy) Hughes, took Ernest Fisk with him as an adviser. The result being that Australia was released from participating in the Norman Plan. In 1923 an Australian Parliamentary Select Committee was convened, resulting in the adoption of an agreement proposed by Fisk, which would see the implementation of a direct shortwave wireless service from Australia to England. Rates for this service would be 33.3% below existing cable charges. The agreement also saw AWA's capital increased to one million pounds and the Australian Government become it's major shareholder. Simultaneously the Australian Government took over AWA's coastal wireless stations, which, up until then, had been running at a considerable loss. This agreement was signed and adopted in March, 1922. Later that year E. T. Fisk visited South Africa and persuaded the Prime Minister of that country to also adopt a direct shortwave Beam Wireless service to England. Fisk traveled on from there to Great Britain, successfully advocating a change in the British Government's policy which subsequently permitted Australian and British wireless companies to establish direct shortwave beam wireless services to England. In 1924 Ernest Fisk conducted wireless experiments from Vaucluse, NSW, in conjunction with Marconi's Poldhu, Cornwall, shortwave transmitter. These experiments demonstrated the feasibility of direct shortwave wireless communication between Great Britain and Australia using relatively low power shortwave equipment. Wireless t elephonic communication was also established in May of 1924, and the first transmission of shortwave wireless telegraphic signals as a public service took place in November, 1924. Having now been proven, shortwave Beam Wireless transmitting and receiving stations for Empire communications were constructed 40 miles northwest of Melbourne at Balan (transmitting site) and 20 miles northwest of Melbourne at Rockbank (receiving site). These become operational in April,1927. The transmitting station at Balan was subsequently name "Fiskville" in honor of Ernest Fisk. 1928 saw the establishment of a similar Beam Wireless service between Australia and Canada. 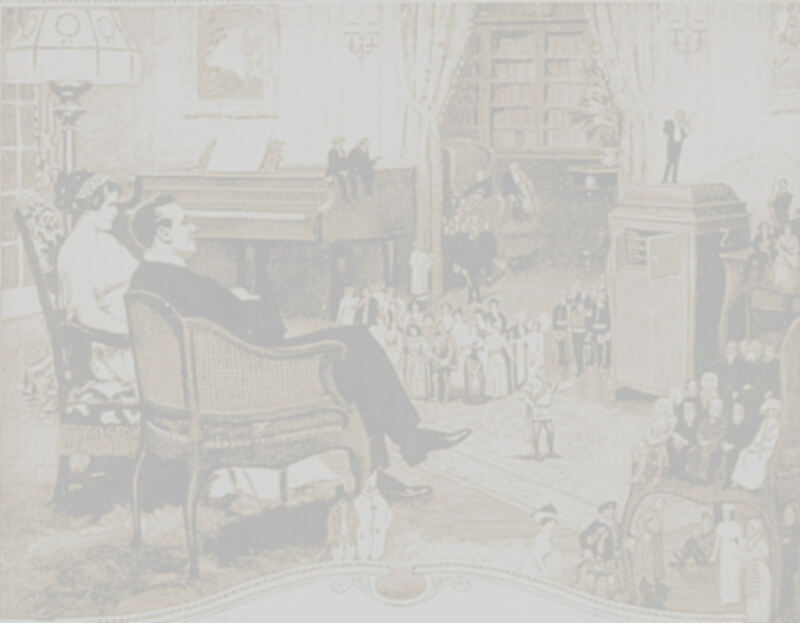 The photo at left shows E. T. Fisk with the then Australian Prime Minister, W. A. (Billy) Hughes. 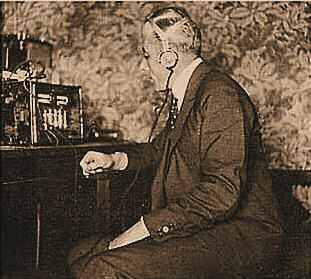 Fisk continued to organize experiments in long distance voice (telephonic) wireless transmissions, including the first inter-Empire broadcast from Sydney to London in September 1927. In April 1930 Ernest Fisk instigated the Australian end of the first inter-Empire direct wireless telephone service. He also pioneered the first world-wide shortwave broadcasting service from Australia, the for runner for what is now Radio Australia. Questioned in 1927 as to what he felt lay ahead for the science of wireless, Fisk nominated international wireless-telephony, picturegram services and further down the track, television. True to form the first two became a reality in the 1930's, with television being delayed by World War 2. During the 1920's and 1930's Fisk continued building up AWA's engineering, manufacturing plant and organization in Australia. This included construction of a modern factory in Sydney, set in large gardens and ultimately employing more than 1,500 people to produce all types of wireless and allied equipment. Manufactured by AWA were receiving and transmitting valves, broadcast receivers, high and low power mediumwave and shortwave broadcast transmitters, military transmitters and receivers as well as audio and test equipment. 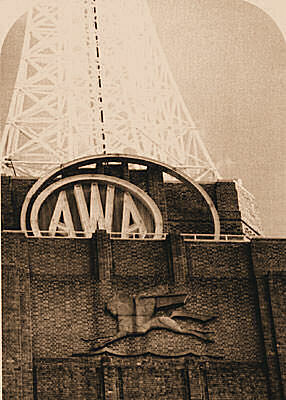 Through Fisk's leadership, AWA beamed the first black and white wireless picture from England to Australia in 1934 and the first colour picture in 1946. Shown above is a Fisk Radiola broadcast receiver, manufactured by AWA in the early 1930's. An independent tribute to Ernest Fisk the amateur, the enthusiast, is provided by the fact that, in 1921, while he was hobnobbing with the Australian Prime Minister and making his presence felt at an Empire level, he was still chairing meetings and 'chewing the rag' with fellow amateur radio operators as President of the NSW division of the Wireless Institute of Australia (WIA). Ernest Fisk was knighted for his services to Australia in 1937. 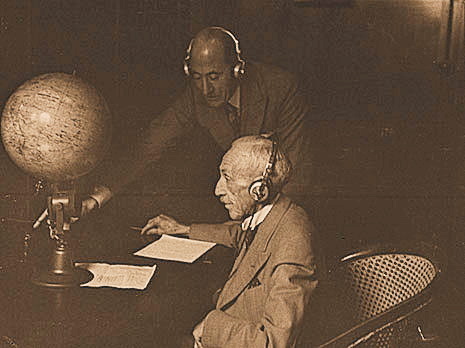 A friend of Fisk's, F. W. Larkins, once wrote of Fisk "As Marconi discovered wireless, so E. T. Fisk discovered a continent - a continent without wireless, but a continent where he was destined to become one of it's greatest wireless pioneers". In 1944 Sir Ernest Fisk resigned his position as Chairman of AWA, leaving AWA's management reins in the capable hands of his long-time deputy, Lionel Hooke. He had accepted the position of Managing Director of Britain's Electrical and Musical Industries (EMI) and, as a result, re-located back to England. Upon his retirement from EMI, at age 65, Sir Ernest Fisk returned to Australia to live, where he remained until his death at age 78, in 1965. 1875 - American inventor, George. R. Carey (born 1851) invented the phototube. 1878 - British chemist and physicist, Sir William Crookes (17 June 1832 – 4 April 1919) invented the 'Crookes tube', an early version of the cathode-ray tube. 1895 - German physicist, Wilhelm Roengten (27 March 1845 – 10 February 1923) invented an early version of the X-ray tube. 1897 - German inventor and physicist, Karl Ferdinand Braun (6 June 1850 – 20 April 1918) invented the cathode ray oscilloscope. 1904 - British Electrical engineer and physicist, John Ambrose Fleming (29 November 1849 - 18 April 1945) invented the first practical electron tube or valve, called the 'Fleming Valve'. This electron tube or valve was a two element diode designed to detect radio signals. 1906 - American inventor, Lee de Forest (August 26, 1873 - June 30, 1961) invented the Audion, later called the triode as it incorporated three elements. It was an improvement on the 'Fleming Valve' because it was capable of providing signal amplification. 1913 - American physicist, William D. Coolidge (October 23, 1873 - February 3, 1975) invented the 'Coolidge Tube', the first practical X-ray tube. 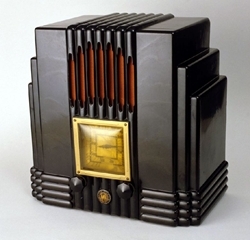 1920 - The company RCA was formed, and amongst other products, marketed a range of triode vacuum tubes / valves. These tubes / valves were manufactured for RCA by General Electric at their lamp works in Harrison, New Jersey as well as by Westinghouse. The manufacturing/marketing agreement between these three companies that allowed this lasted until 1930. 1921 - American electrical engineer, Albert Hull (19 April 1880 - 22 January 1966) invented the magnetron vacuum tube / valve. It was used to generate extremely high frequency oscillation in the microwave region and later went on to be the mainstay of radar during World War 2. 1922 - American Inventor Philo T. Farnsworth (August 19, 1906 - March 11, 1971) developed the first electron tube scanning system for television. 1923 - Russian inventor, Vladimir K Zworykin (July 29, 1888 - July 29,1982) invented the iconoscope or the kinescope. 1926 - American electrical engineers Albert Hull and N. H Williams working for General Electric co-invented the tetrode vacuum tube. 1926 - Dutch electrical engineers Gilles Holst and Bernhard D.H. Tellegen (24 June 1900 - 30 August 1990) working for the Philips Physics Laboratory, invented the pentode vacuum tube / valve. 1938 - American physicists and engineers, the brothers Russell (April 24, 1898 - July 28, 1959) and Sigurd Varian (May 4, 1901 - October 18, 1961)[ co-invented the klystron tube / valve. The klystron allowed low noise amplification of microwave signals. “Radio-Craft” – March 1938 – Hugo Gernsback, Editor. “200 Metres & Down” – 1936 - Clinton B. DeSoto. “Handbook of Technical Instruction for Wireless Telegraphists” – Third Edition 1925 – J. C. Hawkhead. “Handbook of Wireless Telegraphy – 1938 – Admiralty. “Radio Physics Course” – 1930 –Alfred A. Ghirardi. “QST” magazine – May 1934, December 1940, January 1964 – ARRL. “CQ” magazine – November 1959 – Cowan Publishing Corporation. “The Superheterodyne Receiver” – 1941 – Alfred T. Witts. “When I Think Back" - Neville Williams.